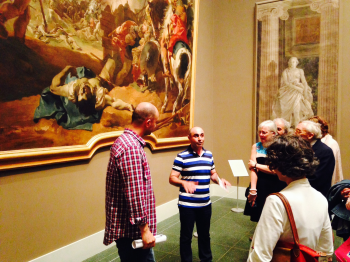 On Saturday, June 14th, members of the NY/NJ Alumni Chapter and friends of LAU visited the The Metropolitan Museum of Art. The evening began with drinks on the roof garden and a viewing of the Dan Graham Pavilion, followed by a gallery tour given by alums Tony Faddoul and Maroun Kassab. The gallery tour focused on some Phoenician and Lebanese -related art and artifacts. LAU President Dr. Joseph Jabbra and Vice President for University Advancement, Marla Rice-Evans, attended the event as well. The evening ended with an enjoyable dinner at Trattoria Pesce Pasta.